WHEN: Friday, December 22, 2017. Two Shows at 3:00pm and 7:00pm. Christmas time is here! 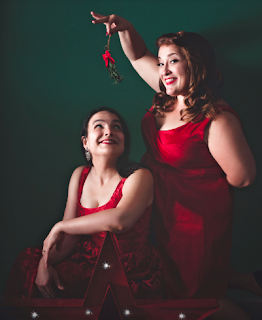 The Sweetback Sisters are back with their ninth annual blow-out holiday sing-along. This wildly popular show requires a bit of audience participation and, especially, a love for all genres of holiday music (fear not, songbooks are provided). Add in a healthy dose of trivia, prizes, and matching outfits and we think it’s safe to say this event lives up to its name: The Sweetback Sisters’ Country Christmas Sing-Along SPECTACULAR! Sweetback Sisters Emily Miller and Zara Bode may not be blood relations, but their precise, family-style harmonies recall the best of rock and country music from the 1950s and 60s. Together with their fine band of brothers, The Sweetback Sisters carry the torch of country music’s finest golden era performers. For this show the girls bring their perfected mix of modern nostalgia to the old holiday songs we all know and love. 3pm matinee is specifically geared towards kids and families. 7pm evening show is for all.